“I’m totally having deja vu right now. Oh, I have it all the time. It’s supposed to mean like someone’s thinking about you while they’re masturbating. You can’t really say “Happy death day” is original. You’ll immediately think of films as “Groundhog day” and recently “Before I fall” when watching this time loop/slasher movie. The same principle with one crucial difference. The person trapped in an apparently infinite time loop is being murdered each time by an unknown person wearing an idiotic mask. Are you expecting a humorous “Friday the 13th” flick? You’ll be pretty disappointed at the end of the film. It’s never as exciting as the infamous slasherfilms from the 80’s. And you can’t call it funny either. Besides the clumsy attempt at the end when a link is made with Bill Murray and the mother of all “time loop” films. Unfortunately my final conclusion was already made. I’m still wondering what the fuzz was all about. It’s kind of my life. The same daily routine over and over again. 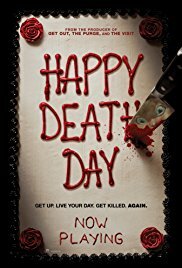 “Happy death day” was kind of a success in the US. Probably because of the release date (on Friday the 13th) and the overall design. A university campus with Tree (Jessica Rothe) as the central figure, who wakes up every morning in the room of Carter (Israel Broussard) after she got brutally killed the night before. I’m assuming she’s sort of a “Miss Popularity” based on her arrogant attitude. Time and again she experiences the same daily routine. First awaking bewildered. Then returning to the dorm in a daze. Absently attending class. Paying a surprise visit to the attractive teacher (you never guess why). Going to a party that same evening. And subsequently, to round of the day, she’s being successfully murdered. A simple storyline which is easy to follow and gradually turns into a kind of whodunit story. So, this movie is suitable for pubescent teenage girls who are balancing between childish teen films and the more serious stuff. “Happy death day” provides a short-lived relaxation without too many creepy elements, so that members of this age group aren’t overwhelmed by outright fear. On the other hand, there’s a bit of that sugary and airy mood, teen girls can identify themselves with. Tree is such a girl figure others might look up to and who they would love to have as best friend. A fairly snobbish type with also a rebellious side. Her walking around naked is a shining example of that. And last but not least, one can safely eat a maxi-pack of popcorn or a full load of nachos during this film, because you won’t see really nauseating or bloody scenes. Pros enough to lure a complete teen audience into the cinema. Just a mediocre Halloween-night movie. The funniest (and most predictable) part of this film is of course the moment when the victim can predict future incidents as a true Nostradamus. The one who’s witnessing this, stares at it in slack-Jawed amazement. The makers succeeded in giving it an original twist. After every rebirth, Tree suffers more and more from sustained injuries. But apart from that, this is just a mediocre film. A kind of a Columbus case which needs to be solved after several time loops. It was not easy to point out the ultimate perpetrator. To be honest, I thought that was rather far-fetched. Really a film to watch with a few friends on a Halloween night. No more, no less.